The Simpsons' twenty-sixth season premiered on Fox in the United States on September 28, 2014, and concluded on May 17, 2015. In this season, Krusty the Clown retires after his father dies ("Clown in the Dumps"); Homer and Bart attempt to solve some father/son conflicts ("The Wreck of the Relationship"); Marge opens a sandwich franchise ("Super Franchise Me"); the Simpsons meet their former (The Tracey Ullman Show) selves ("Treehouse of Horror XXV"); Mr. Burns finds a girlfriend in Democratic Assemblywoman Maxine Lombard ("Opposites A-Frack"); Bart schemes to bring down his new fourth grade teacher, Mr. Lassen (guest voice Willem Dafoe), who is a terrible bully ("Blazed and Confused"); Homer has a mid-life crisis ("Covercraft"); and the cast of Futurama make an appearance in Springfield in a crossover episode ("Simpsorama"). Additional guest voices for this season include Nick Offerman, David Hyde Pierce, Jeff Ross, and Matthew Sweet. After being offended by a comedy cable channel roast of him, Krusty goes to his father for advice, only to have him die before he can say whether or not he found his son funny, causing Krusty to decide to retire. Meanwhile, fear of losing her own father causes Lisa to try to protect Homer from unhealthy food choices. Homer is tired of Bart disrespecting him, so he attempts to parent Bart, by forcing him to eat his broccoli. This goes nowhere, so Marge signs them up for the Relation Ship to solve their problems. Meanwhile, while Homer's away, Marge takes over his Fantasy Football league. On board the Relation Ship, Homer does not enjoy sea life while Bart excels at sailing and becomes mid shipman, much to Homer's dismay. After her sandwiches become popular at Springfield Elementary, Marge opens a sandwich store. It becomes a huge success, until the same franchise opens another store right across the street. School is Hell: Bart and Lisa find a desk carved with an Aramaic incantation that sends them to Hell – and Bart fits in at the school there. A Clockwork Yellow: Moe leads a Clockwork Orange-style gang, but one of his droogs (Homer) falls for a woman (Marge) and gives up life as a thug. The Others: The Simpsons are haunted by their former selves from The Tracey Ullman Show – and Homer falls for the older Marge, angering the current Marge. When Mr. Burns starts a fracking operation, Lisa brings National Assemblywoman Maxine Lombard to put a stop to it, only to have Burns and Lombard fall in love. In a crossover with Futurama, when a time capsule containing a sandwich with Bart's germs in it, Milhouse's rabbit's foot, and radioactive ooze causes a catastrophe in the future, the Planet Express crew comes to present-day Springfield to stop the Simpsons from creating the mess in the first place. Bart schemes to humiliate his new teacher, Mr. Lassen, who is a terrible bully. Meanwhile, the Simpsons go to "Blazing Guy" for their camping trip, but Mr. Lassen is also there, so Bart plans to ruin his day as revenge for cutting his hair. When Homer has a midlife crisis, he forms a band of Springfield dads. Despite the band's modest early success, Apu ends up being a breakout star and stealing the show. This episode also features the first appearance of Sideshow Mel's family. Marge kicks Homer out of the house after Moe convinces him to stay out all night on Christmas Eve at his bar. Depressed, Homer takes a lonely walk through Springfield instead of being with his family, who go out to find him when Moe confesses it was his fault. The Simpson family attend a trip to an amusement park named Dizneeland, where they go on a ride called "Rocket to Your Doom" and accidentally end up on Rigel 7, the home planet of Kang and Kodos. Homer goes to a hypnotist and ends up believing he is ten years old. However, when the hypnotist is arrested, Homer becomes stuck in his new age, so he bonds with Bart and refuses entry back into the responsibilities of adulthood. Elon Musk arrives in Springfield, where he and Homer become fast friends, but Musk soon incurs the wrath of Mr. Burns when his ideas become over-the-top, which forces Burns to terminate all his employees, prompting Homer to try to end their friendship to save his job. Lisa writes a new Springfield anthem after discovering the old one was plagiarized. Note: This is the only episode where Bart appears, but has no lines. As a result, this leaves Homer the only Simpson family member to speak in every episode. Homer takes Lisa to bring your daughter to work day, where she has fun watching him. A Nigerian princess named Kemi comes to Springfield, as her father intends to work out a uranium deal with Mr. Burns, and Homer is chosen to protect her due to his love for Lisa showing on the camera. Moe, having recently lost his money to a Nigerian prince, believes Kemi must be related to the scammer, but soon starts falling for her. Chief Wiggum gets a jet pack, which he uses to fight crime. However, after he unintentionally crashes it into the church, Marge leads the rest of the Springfield congregation toward gambling in an attempt to rebuild it. 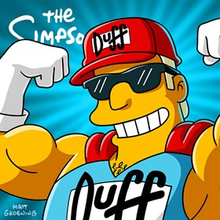 When Duffman undergoes hip replacement surgery following an injury during a parade and retires, Duff Beer's owner Howard K. Duff VII sets up a reality show presented by Cat Deeley in order to find his replacement. The competition is fierce until only Homer Simpson and one other competitor remain, and because the job requires him to stay sober during work hours, he learns that beer isn't as necessary as he thought to have a good time. Returning home with Maggie from errands, Marge discovers that a part of Springfield is now totally destroyed. As Chief Wiggum announces that Bart could be the culprit, Bart says that he was not involved at all in the incident. This prompts Marge to follow him everywhere until he confesses. Meanwhile, Homer ignores Santa's Little Helper once again when he meets Flanders' new dog named Baz. Homer finds an old film strip, which prompts the story of Bart and Lisa's sibling rivalry to be told. The story explores Bart and Lisa's adventures as young children when Ned and Maude family invite Homer and Marge to brunch. After Homer sees an expensive birthday, he complains about not getting the good things at his parties as a kid and ruins birthday parties all over town and is then forced to throw a party for Ned's son Rod. At Rod's party at the Air Force museum, Grampa tells the family stories about his days in the U.S. Air Force and reunites with his old friends. When Grampa's friends see how Homer treats his dad, they start forcing him to treat him right. Meanwhile, Bart begins using E-cigarettes to impress Milhouse's cousin Annika, who he has a crush on. When Bart is bullied after a school dance, Marge gets the city to adopt a tough anti-bullying law that gets Homer arrested when Rod and Todd claim that he's bullying Ned, but Ned refuses to forgive Homer. When the school goes all-digital thanks to a donation from Springfield Elementary alumni and all of the electronics go out, Lisa suggests turning the school into a Waldorf school, where kids "learn by doing" with hands-on interactions with Lunchlady Doris and Groundskeeper Willie. Later, Willie is put in charge of the school Mathletes team against Waverly Hills, the better funded elementary school in the district, after Lisa sees him put new grass in. Much to his dismay, Bart is put on the team. ^ Bibel, Sara (September 30, 2014). "Sunday Final Ratings: 'Once Upon A Time', 'Resurrection' & 'Revenge' Adjusted Up; 'CSI' Adjusted Down". TV By the Numbers. Archived from the original on October 1, 2014. Retrieved 30 September 2014. ^ Bibel, Sara. "Sunday Final Ratings: 'Once Upon a Time', 'Resurrection' & 'Revenge' Adjusted Up; 'Madam Secretary' Adjusted Down". TVbytheNumbers. Archived from the original on October 9, 2014. Retrieved 8 October 2014. ^ Bibel, Sara (October 14, 2014). "Sunday Final Ratings: 'Once Upon A Time', 'Brooklyn Nine-Nine' & 'Resurrection' Adjusted Up; 'Madam Secretary' Adjusted Down". TV by the Numbers. Zap2it. Retrieved October 15, 2014. ^ Kondolojy, Amanda (October 21, 2014). "Sunday Final Ratings: 'The Simpsons' & 'Madam Secretary' Adjusted Up; 'Mulaney' Adjusted Down". TV by the Numbers. Zap2it. Retrieved October 21, 2014. ^ Kondolojy, Amanda (November 3, 2014). "Sunday Final Ratings: 'The Good Wife', 'Brooklyn Nine-Nine', 'Once Upon a Time' & '60 Minutes' Adjusted Up + Final Football Ratings". TV by the Numbers. Zap2it. Retrieved November 2, 2014. ^ Bibel, Sara (November 11, 2014). "Sunday Final Ratings: 'The Simpsons', & 'Brooklyn Nine-Nine' Adjusted up". TV by the Numbers. Zap2it. Retrieved November 11, 2014. ^ "Sunday Final Ratings: 'The Simpsons' & 'America's Funniest Home Videos' Adjusted Up + Final Football Numbers". TVbytheNumbers. Retrieved 18 November 2014. ^ Bibel, Sara (November 25, 2014). "Sunday Final Ratings: 'Madam Secretary', 'The Simpsons', '60 Minutes' & 'America's Funniest Home Videos' Adjusted Down & Final Football Numbers". TV by the Numbers. Retrieved November 25, 2014. ^ Bibel, Amanda (December 9, 2014). "Sunday Final Ratings: 'The SImpsons' & 'Family Guy' Adjusted Up, '60 Minutes' Adjusted Down & Final Football Numbers". TV by the Numbers. Retrieved December 9, 2014. ^ Bibel, Sara (January 8, 2014). "Sunday Final Ratings: 'The Simpsons', 'Madam Secretary', 'Brooklyn Nine-Nine', 'The Celebrity Apprentice', 'Bob's Burgers' & 'CSI' Adjusted Up". TV by the Numbers. Retrieved January 8, 2014. ^ Kondolojy, Amanda (January 13, 2015). "Sunday Final Ratings: 'The Good Wife' Adjusted Up + Final Rating for 'The Golden Globes' and NFL". TV by the Numbers. Retrieved January 15, 2015. ^ Kondolojy, Amanda (January 27, 2015). "Sunday Final Ratings: No Adjustment for 'Galavant', 'Revenge' or 'CSI'". TV by the Numbers. Retrieved January 27, 2015. ^ Kondolojy, Amanda (February 10, 2015). "Sunday Final Ratings: Grammy Awards Adjusted Down; No Adjustment for 'Brooklyn Nine-Nine' or 'Bob's Burgers'". TV by the Numbers. Retrieved February 10, 2015. ^ Bibel, Sara (February 18, 2015). "Sunday Final Ratings: No Adjustments for 'Saturday Night Live - 40th Anniversary', 'The Bachelor' or 'CSI' Finale". TV by the Numbers. Retrieved February 18, 2015. ^ "Sunday Final Ratings: 'The Last Man on Earth' & 'Dateline' Adjusted Up". TVbytheNumbers. 2015-03-03. Retrieved 2015-05-04. ^ "Sunday Final Ratings: 'The Last Man on Earth', 'Bob's Burgers', 'Family Guy', 'Brooklyn Nine-Nine' & 'Revenge' Adjusted Up". TVbytheNumbers. 2015-03-10. Retrieved 2015-05-04. ^ "Sunday Final Ratings: 'The Last Man on Earth', 'Secrets & Lies', 'Battle Creek' & '60 Minutes' Adjusted Up". TVbytheNumbers. Retrieved 18 March 2015. ^ Kondolojy, Amanda (April 21, 2015). "Sunday Final Ratings: 'Once Upon a Time', 'Secrets & Lies', & 'A.D. : The Bible Continues' Adjusted Up; 'ACM Awards', & 'American Odyssey' Adjusted Down". TV by the Numbers. Retrieved April 21, 2015. ^ Bibel, Sara (April 28, 2015). "Sunday Final Ratings: 'Family Guy' Adjusted Up; No Adjustments to 'Once Upon A Time'". TV by the Numbers. Retrieved April 28, 2015. ^ Kondolojy, Amanda (May 5, 2015). "Sunday Final Ratings: 'Family Guy' & 'Secrets and Lies' Adjusted Up'". TV by the Numbers. Retrieved May 5, 2015. ^ Bibel, Sara (May 12, 2015). "Sunday Final Ratings: 'Once Upon A Time' & 'Brooklyn Nine-Nine' Adjusted Up". TV by the Numbers. Retrieved May 12, 2015. "The Wreck of the Relationship"
"The Musk Who Fell to Earth"
"The Kids Are All Fight"
"Let's Go Fly a Coot"
This page was last edited on 5 November 2018, at 11:21 (UTC).